While not strictly an 'astronomical' image of the sun (and certainly not a planet at all), this photograph to me evokes the power of sunsets to put a halt, if only for a moment, to what is consuming our lives at the time and to pay attention to mother nature. For me, it has the same effect as staring into a campfire, only with the moment being very fleeting and in no way under our control. 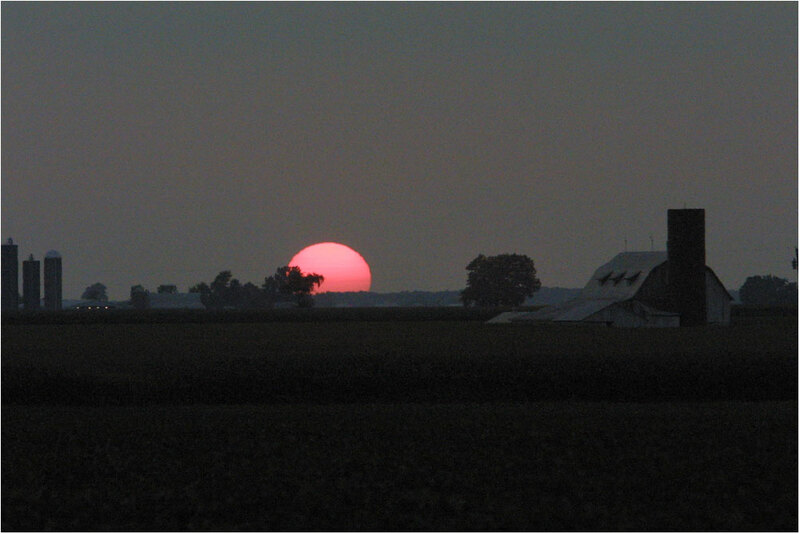 I happened across this scene while driving through central Illinois on August 12th, 2003. It looked light it might be a good day for sunsets, so I had the camera with me. Canon D30 with a Canon 200mm f/2.8 lens, ISO 200, 1/125th of a second exposure. The lights had just come on in the farmhouse on the left side of the image. Mars on October 17th 2007. 12" LX200 at f/20 (using a Teleview 2x barlow), Philips SPC900NC camera shooting through a Baader UV/IR blocking filter at 30 frames per second. Stack size is about 40 frames. Mars was near the zenith, morning twilight was apparent; sunrise was about 30 minutes away. Mars on October 22nd 2007. Same setup as the image to the left. Stack size is 16 frames. This image has been processed a bit more to bring out more detail. Syrtis Major, the bright Hellas region as well as the north polar cap are easily visible. I like the image to the left better as it's a bit more true to the view through a telescope. 12" LX200 at f/20 (using a Teleview 2x barlow), SBIG ST237A. The moon is Io, and the Great Red Spot is visible in the lower left. This is an RBG image combined in Photoshop. 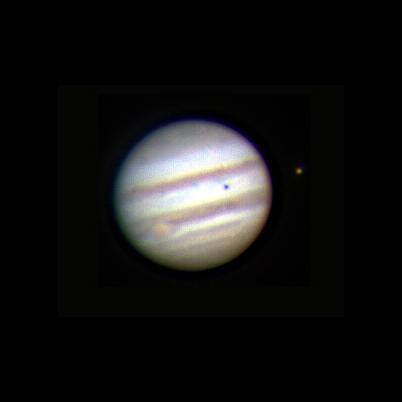 Jupiter on the 28th of July 2009 at 0730Z (3:30AM). Jupiter was struck by an object on July 19th, 2009. The 'impact scar' is the dark blotch on the extreme lower right of Jupiter. 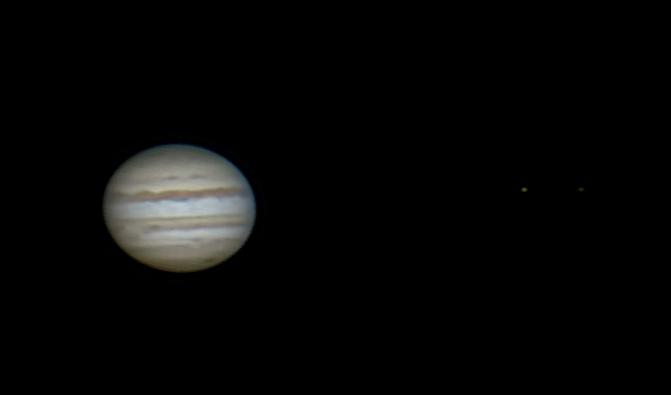 Far to the right are two of Jupiter's moons, Io (closest to Jupiter) and Europa. They are faint, so depending on the settings of your monitor you may not be able to see them. Summer of 2003. 12" LX200 at f/20 (using a Teleview 2x barlow), SBIG ST237A.